Eine weitere Indikation für den Roboter? Leiomyome des Ösophagus sind seltene Tumoren, jedoch die häufigsten gutartigen Tumoren des Ösophagus ausgehend von der glatten Muskulatur. Die Symptomatik wird durch die Größe des Tumors bestimmt und tritt durch Dysphagien oder retrosternale Beschwerden in Erscheinung. Ein Großteil aller Patienten ist jedoch asymptomatisch. Zur Diagnostik zählen Ösophagoskopie, Endosonographie und Computertomographie. Die Chirurgie gilt als Therapie der Wahl und umfasst im Idealfall eine Enukleation des Tumors, kann jedoch bis zur Ösophagektomie führen. Neben den klassischen offenen Verfahren finden minimalinvasive Verfahren Anwendung. Unabhängig von dem gewählten Verfahren soll eine Läsion der Mukosa vermieden werden. Übersicht der Literatur thorakoskopischer und roboterassistierter thorakaler Enukleationen in der Behandlung von Leiomyomen unter Illustration durch einen klinischen Fall. 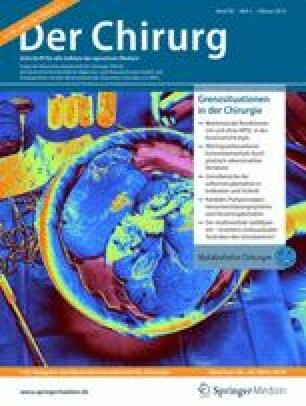 Übersichtsarbeit zur minimalinvasiven chirurgischen Therapie von Leiomyomen des Ösophagus. Die Literaturrecherche erfolgte mit PubMed und ergab Veröffentlichungen thorakoskopischer und roboterassistierter thorakaler Enukleationen von Leiomyomen am Ösophagus. Zusätzlich wird die roboterassistierte thorakale Enukleation eines hufeisenförmigen Leiomyoms im mittleren Ösophagusdrittel beschrieben. Über eine rechtsthorakale roboterassistierte Operation, unter Einlungenventilation, erfolgte die Enukleation des Leiomyoms des Ösophagus. Die Operationszeit betrug 143 min. Es gab kein Ereignis intraoperativer bzw. postoperativer Komplikationen. Am 3. postoperativen Tag erfolgten der Kostaufbau sowie die Entfernung der Thoraxsaugdrainage. Die histopathologische Aufarbeitung bestätigte ein Leiomyom. Der Patient wurde am 5. postoperativen Tag beschwerdefrei entlassen. Die roboterassistierte Operation bei Leiomyomen des Ösophagus ist ein sicheres Verfahren. Unter Berücksichtigung der Datenlage können für roboterassistierte thorakale Enukleationen von Leiomyomen sowohl weniger Mukosaläsionen, allgemeine Operationskomplikationen sowie eine geringere Konversionsrate sowie auch ein kürzerer Krankenhausaufenthalt im Vergleich zur „klassischen“ thorakoskopischen Enukleation festgestellt werden. Somit kann die roboterassistierte Operation bei Leiomyomen des Ösophagus das Verfahren der Wahl darstellen. A further indication for robotic surgery? Leiomyomas of the esophagus are rare tumors but the most common benign lesion of the esophagus originating from smooth muscle cells. The symptoms are mainly determined by the size of the tumor and are caused by dysphagia and/or retrosternal pain. The majority of patients are however asymptomatic. The diagnostics include esophagoscopy, endosonography and chest computed tomography. Surgery is considered the treatment of choice and ideally involves enucleation of the tumor but may lead to esophagectomy. In addition to the classical open procedures, minimally invasive procedures are also used. Regardless of the selected procedure, a lesion of the mucosa should be avoided. A review of the literature on thoracoscopic and robotic resections in the treatment of leiomyomas was carried out and an illustration of a clinical case is presented. A review of minimally invasive surgical treatment of esophageal leiomyomas is presented. The literature search was carried out in PubMed for publications of thoracoscopic and robotic-assisted thoracic enucleation of leiomyomas of the esophagus. In addition, the robotic-assisted thoracic enucleation of a horseshoe-shaped leiomyoma in the middle third of the esophagus is described. The enucleation of the esophageal leiomyoma was carried out through a right-sided robotic-assisted operation with one lung ventilation. The surgery time was 143 min. There were no intraoperative or postoperative complications. On the 3rd postoperative day a light diet was started and the thorax drainage was removed. Histopathology confirmed a leiomyoma. The patient was discharged on the 5th postoperative day and free of complaints. Robotic-assisted surgery for leiomyomas of the esophagus is a safe procedure. Taking the available data into account, robotic-assisted thoracic enucleation of leiomyomas was characterized by less mucosal lesions, general complications and a lower conversion rate as well as a shorter hospital stay compared to classical thoracoscopic enucleation. Thus, robotic-assisted surgery can be the method of choice for leiomyomas of the esophagus. S. Inderhees, A. Dubecz, J. Tank und H.J. Stein geben an, dass kein Interessenkonflikt besteht.